Please note that the content of this book primarily consists of articles available from Wikipedia or other free sources online. Jefferson Township is one of the thirteen townships of Clinton County, Ohio, United States. The 2000 census found 1,301 people in the township, 1,036 of whom lived in the unincorporated portions of the township, down from 1,312 in 1990. Major highways include U.S. Route 68 and State Routes 28 and 251. 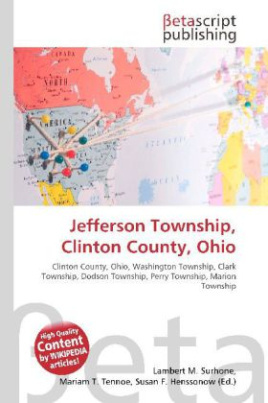 Named for President Thomas Jefferson, it is one of twenty-four Jefferson Townships statewide. It was erected from Clark and Marion Townships by the Clinton County Commissioners in 1839.